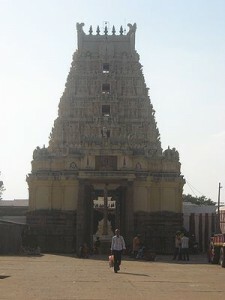 The shrine of Lord Narasimha situated about 70 km from Nandyal in Kurnool district. It is only here that all nine forms of the deity or “Nava Narasimha” are worshipped. There is a lower Ahobilam and an upper Ahobilam. The shrine at upper Ahobilam is a 9 km trek from the foothill and the path passes through dense forests and beautiful dales interspersed by silvery cascades. Air: Ahobilam is situated 360 km from Hyderabad and 230 km from Tirupati, both of which have airports. Rail: Nandyal on the Guntur-Dharmavaram line is the nearest railhead (70 km). Road: Andhra Pradesh State Road Transport Corporation buses to Ahobilam from Hyderabad and important centers as well as Chennai. This entry was posted in Ahobilam, Andhra Pradesh. Bookmark the permalink.